This morning, I walked the Furry Happiness Guru to our favorite morning contemplation spot and looked out to the ocean… Where I normally see calm waters, some pelicans, and maybe a surfer or two, I saw a huge naval ship making its way across the sea. It was right on the horizon line, so it really appeared to be just gliding across the water-top, as if by magic. And I found myself thinking, How in the world does that even work? I don’t get it. How does something so huge, so heavy, so solid stay afloat on the water? And then a plane went by and I thought the same thing. How does THAT work? I found myself going down a mental road that some would call a “stoner moment”, but allowed my mind to wander that way as Sophie gleefully sniffed the flowers all around us. The Universal Laws are the same way. The Law of Attraction (“like attracts like” or “What you plants grows”) works. Always. It is law. I don’t need to understand HOW it works, it just does. So I can try to ignore it, or fight it and prove it wrong, or trust its design. I don’t need to understand HOW the Law of Gravity works, but sure enough, I throw that ball to Sophie and it lands on the ground every single time. I trust that it will. Just the way I trust the boat will float and use that knowledge to my benefit. Now, you skeptics out there may be saying, Yeah, but boats sink. What’s up with that? To you I say, Here, have a cookie, good question. Then I say, Yes Mr. Smarty Pants, the boat can sink, but NOT because of its design, but because of a CRACK in the foundation. With the Law of Attraction, that comes in the form of some underlying negative vibration. For example, you decide you need more money. (Who doesn’t, right?) So you start saying to yourself, I need more money in my life. Well, there’s a crack in that, because by “needing” the money, you are attracting more “needing” into your life. So your ship will sink and you will be mad and you will stomp your feet and claim that the Law of Attraction is bogus. But the LOA is there. In perfect design. You just need to work with it properly… The boat isn’t gonna keep floating if you smash it into an iceberg. Duh. But every time you send out a negative thought, you are igniting a vibration that smashes the bejeezus out of that boat. Why you do that, silly? So question it, for sure. Understand its grandeur. Read about it. Consciously try it out. But check yourself when your mind starts to get all ego-driven and needing to understand how it all goes down. 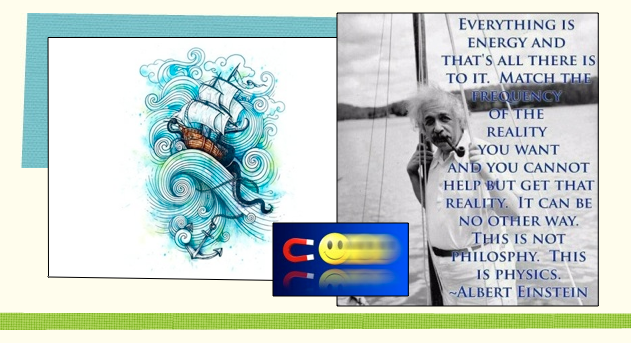 Just ride your ship, avoid icebergs, and KNOW that what you plant grows… Every. Single. Time.